By default, the Configuration Advisor assumes that you are going to select and submit one of the recommended threshold settings. 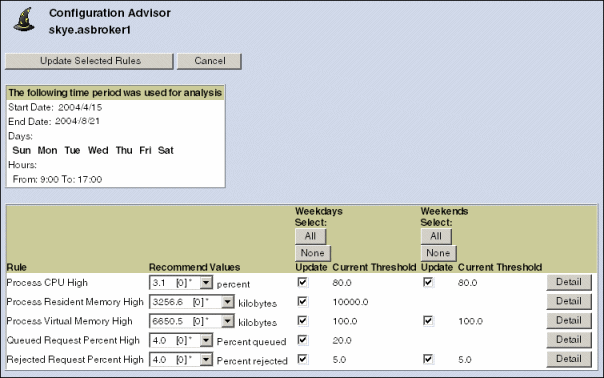 The Configuration Advisor selects the Update option for each rule. However, you have options concerning the selection process. As you compare the existing and recommended values, you can elect to change none, some, or all values for a rule and each individual monitoring plan. Use the following procedure to compare the current rule setting with the recommended threshold settings and to update each schedule with your specific selections. Perform this comparison to help you further determine your final selection. 2. Click Recommended Values to display the range of recommended values for the associated rule. 3. Compare the possible Recommended Values that appear with the value in the Current Threshold field. As you determine the best threshold rule setting, keep your goals for this rule in mind. Also, consider any additional selection criteria as you compare the various values. See Additional selection criteria for details. Click All to select all of the recommended threshold settings for a monitoring plan. Click None to deselect all of the recommended threshold settings for a monitoring plan.